Opens the Source Control Explorer for the currently selected item in the solution explorer or active document. Source is available at the More Info Url. Opens up the Source Control Explorer window to the location of the currently selected file. This works from the Solution Explorer and from the active document. It works in Community editions and better. It was inspired by several extensions that have a "Locate in Solution Explorer" command which highlights the item you're working on in the Solution Explorer. Updated for Visual Studio 2015. Thanks to o-farooq for the pull request. Updated for Visual Studio 2015. Thanks to holm0563 for the pull request. On a system that uses a European culture info the version string "12.0" is converted to a double with the value 120. This should fix some of the null reference exceptions that some of you have reported. Thanks to **sitofabi** for the diagnosis and pull request. 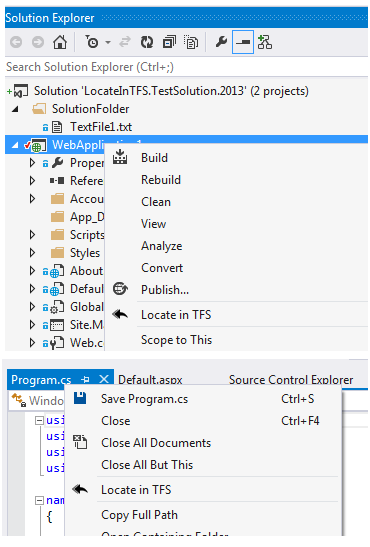 In VS2012 and VS2013, when the Source Control Explorer was not already open the "Locate in TFS" command would only open to the root TFS path. This has been fixed, it will now open to the selected file. The Source Control Explorer's file browser will now scroll to the selected file, if necessary. Please post any bugs, feature requests, and other feedback on github. The source code is also available there.